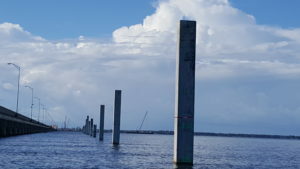 Concrete test piles are being driven at each “bridge bent” location to determine the lengths and driving criteria for the production piles that will be driven at the location. The production piles will provide the foundation for the new bridge(s). More than 2,000 test and production piles are scheduled to be driven. 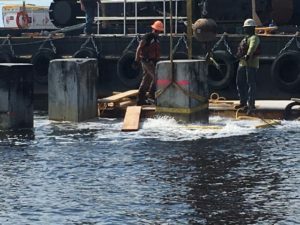 Twenty-four members of the Pensacola Bay Bridge construction team and their families participated in the recent “Project Greenshores” bay clean-up. 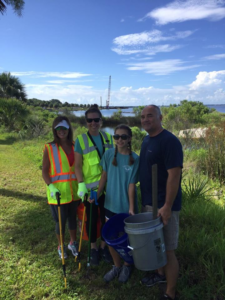 The team collected 196 pounds of trash and debris along Bayfront Parkway and Wayside Park in Pensacola. Drivers will encounter alternating lane closures on U.S. 98 east and westbound between 17th Avenue and the bridge and on the Gulf Breeze approaches to the bridge from 8 p.m. to 5 a.m. Monday, July 17 through Saturday, July 22.